The way that people communicate with businesses is changing. Gone are the days of customers who will leave detailed voicemails, wait patiently for replies to emails, or search across a restaurant’s websites and social profiles to find answers to their specific questions. In an age where more and more businesses offer live chat support, customers expect to be able to get answers to their questions in real time, whether they have a question about making a reservation or want to ask about booking a private event. Real-time customer communication isn’t just a nicety, it’s a reasonable request. A recent poll indicated that 90% of consumers would prefer to text businesses rather than call. And consumers look positively on brands that offer the ability to get quick answers via real-time messaging channels — 77% of people have a positive perception of companies that offer texting as a customer support channel. In the hyper-competitive restaurant world, providing real-time support to consumers learning about your restaurant is more important than ever. According to a recently OpenTable study, more and more diners are making reservations within 24 hours of arriving at a restaurant, and nearly 30% of customers are searching for restaurants within an hour of their meal. In short, restaurant guests have an increasing number of ways to discover restaurants, and restaurants that hope to capture customer attention in this ever-shrinking window of discovery need to be able to answer their questions instantly wherever a customer is online. Restaurants are already starting to adapt to this shift. Some of the best restaurants in the world are abandoning landlines in exchange for modern, real-time customer communication via SMS and other digital channels. It’s not surprising that the largest restaurant discovery platforms in the world, from Facebook and Instagram to Google and Yelp, are actively rolling out tools to let restaurants be active, responsive, and easily messaged on all these platforms. Restaurants’ profile pages on these platforms now clearly show how long it takes for businesses to reply to customers who message them, in an attempt to remove the layer of frustration that comes when a customer reaches out to a business with no idea when or if they’ll ever hear back. To encourage messaging adoption, platforms like Facebook and Yelp enable the messaging function by default. Showing up as “responds in more than a day” on these platforms where new customers are discovering restaurants can be enough to kill a potential sale right off the bat. But how can restaurants easily manage customer messages in realtime when more and more major platforms are adding messaging functionality every month? In this article, we’ll outline four simple ways that restaurants can enable messaging without adding headcount, costs, or complex new processes to their existing customer engagement strategy. More than any other platform, Google is where the most people are learning about restaurants. Sites like OpenTable heavily promote their value as discovery platforms, and Google is no different. Here’s a snapshot from the Google My Business listing for Mezze Bistro, a Guestfriend customer. Nearly 75% of the people who found Mezze on Google were discovering them for the first time, rather than searching for them directly. Restaurant owners should do everything they can to ensure that those thousands of potential customers can easily get all the info they’re looking for without having to go searching on competitor-laden platforms that are outside of your control. 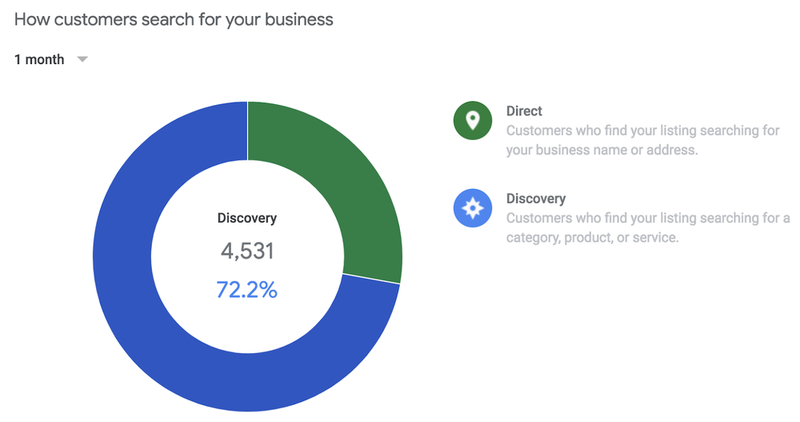 Google is investing heavily in its Google My Business platform to ensure that customers can easily discover any restaurant, learn everything they could possibly want to know about that restaurant (from exploring a menu to finding out specific details like dress code), and book a table without ever having to leave the Google ecosystem. For restaurants, the value of this is undeniable — up until now, a diner might discover a restaurant on Google, but if they wanted to explore the menu, make a reservation, or find some other specific detail about the business, they’d need to go offsite to a platform like Yelp or OpenTable to get answers to their questions. And once someone leaves the restaurant’s controlled environment on Google, the chance of them discovering a competitor and deciding to eat there instead goes up significantly. But how do you let people make reservations, browse your menu, and answer more difficult questions that Google doesn’t support, without making them leave your Google page or call your restaurant? Even if you keep your business info up to date on Google, there are still a lot of things that guests can’t do on Google. Previously, they’d need to go to another site or call your restaurant to do things like make a reservation. That is, until now. Google now lets you enable Messaging within your GMB account. Currently the only way to enable Messaging on Google and ensure that your guests are receiving real-time replies without any extra work by your team is to use an automated messaging solution (like the one we built at Guestfriend). Connecting a “virtual host” to Google will let your guests get real-time answers to their questions in their preferred messaging format, without forcing them to call your restaurant or go searching for answers off-site. 95% of businesses have the “Message Us” button enabled on their Facebook page, but most don’t even realize it. While smaller restaurants may only get a few messages a week from potential diners, large national brands with millions of followers need a plan to answer all of these messages at scale. From our research, the average response time for restaurants is several hours at best and never in many cases. Based on the fact that more and more diners are making decisions within a few hours of dining, lack of responsiveness is a major reason why restaurants lose customers. Even if your restaurant has a plan in place to periodically reply to customer messages on Facebook, it probably isn’t fast enough. So how do you automate messaging so that customers get intelligent answers to their questions in real time and then only get routed to a real person for complex questions? Facebook provides a variety of tools to create your own automated replies, but your development team will need to devote extensive resources if you hope to create anything that is even remotely flexible. Alternately, you can build your own solution on a chatbot authoring platform, which can take several months, or use a custom virtual host built specifically for your restaurant, which you can customize and deploy within a few hours. If you have a chatbot or “virtual host” connected to your brand’s Facebook page, then you should be using Facebook Discover. 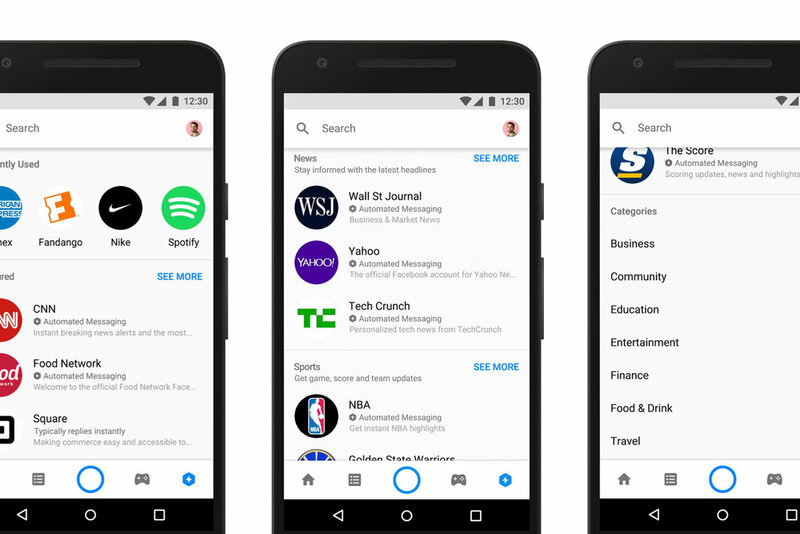 Discover is a product that Facebook launched on Messenger last year, which lets its users easily discover new chatbots that are either relevant to their interests or geographically close to them. Being featured on Discover opens up your restaurant to an entirely new audience of potential customers. And the best part is that it takes two minutes to submit, and you’ll be one of the only restaurant brands in the world using it! It’s an effortless way to get more people organically discovering your business with no marketing spend required. We wrote more about this here. Phones and landlines for restaurants are dying. In most scenarios, when someone tries to call a restaurant, they either go straight to voicemail or get connected to a host during busy hours and can’t hear anything. Any way you slice it, phones for restaurants are largely pointless and archaic, only delivering negative experiences. Texting is the future. 90% of people want to message businesses instead of calling. But outside of enabling messaging on platforms like Google and Facebook, how do you quickly set up the infrastructure to let your guests text an actual phone number and receive real-time replies to their questions? 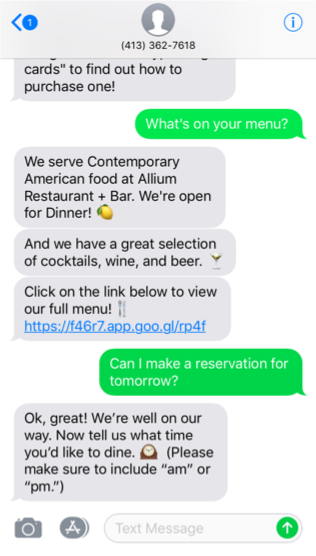 If you have an automated messaging solution in place, anytime someone texts your restaurant, they’ll get real-time answers and be able to have a natural language conversation with your virtual host, with no work required by your team and full control over the exact responses guests receive. At Guestfriend, we provide local SMS numbers, automatically connected to your brand’s custom virtual host, that can be promoted on your social media pages, across your website, in your phone voicemail recordings, and more. Alexa, Google Assistant, Siri, Cortana. Every major platform now has a voice-based personal assistant that will give you instant answers to nearly any question. Voice is exploding and it’s going to change the way that people interact with restaurants. Some reports estimate that nearly 50% of searches will be voice by 2020. Search results and search marketing are going to be heavily affected by this shift to voice and Google is actively figuring out how to handle things like SEO in a world dominated by voice searching. It remains to be seen how restaurants will be able to affect and/or sponsor voice search results, but it seems more and more likely that voice technology will simplify the way people learn about businesses and then allow them to take specific actions. It’s not hard to imagine that in the coming years, you’ll be able to discover, learn about, and book a table at a restaurant within a few seconds, all with your voice. There’s never been a more exciting time to be involved in the digital customer experience side of the restaurant industry. The tools to engage guests across a huge number of platforms are readily accessible and easy to use, and the shift from an asynchronous customer experience to a real-time one is well underway. And restaurants that are able to leverage these tools to their fullest get to shape what “customer experience” in the modern restaurant world actually looks like. Every month, more and more platforms roll out messaging features (Google being the most recent and Instagram coming very soon). While the growing number of platforms that customers can use to get in touch with your business might seem daunting, there are finally tools built specifically for the restaurant industry that let you manage and automate customer communication for the first time. And undoubtedly, allowing your customers to get in touch with you in their preferred medium is the best way to differentiate yourself and capture more business. We mentioned “virtual hosts” several times in this article. To recap briefly, a virtual host (sometimes called a chatbot) is a tool that lets your restaurant interact with your customers in real time across all of your online channels. Most virtual hosts, like the ones we build on our Guestfriend platform, can answer 95% of guest questions instantly, and then seamlessly route guests to your normal customer support channels for specific questions that you identify. If you’re looking for an automated messaging solution built specifically for your restaurant that lets you handle customer messaging online in a scalable way, check out what we’ve built at Guestfriend. We’d love to chat. About the Author: Alec McGuffey heads marketing initiatives at GuestFriend, the virtual host built for the restaurant industry.